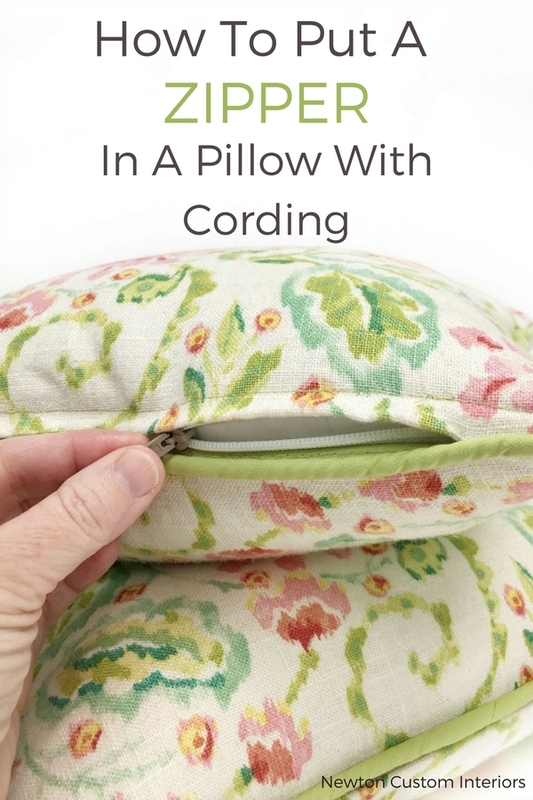 Do you struggle with how to put in a zipper for pillow with cording? Learn how with this detailed, step-by-step video tutorial. 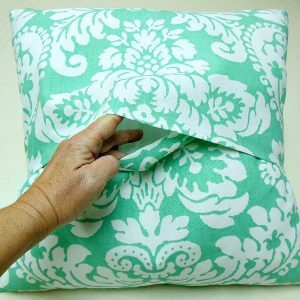 You won’t ever struggle with sewing a zipper in a pillow again! Pillows are a great way to update any room in your home! 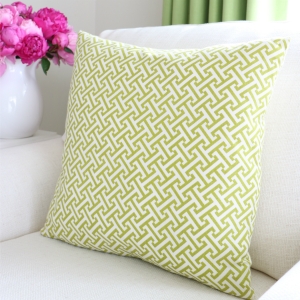 Pillows are a quick and easy way to update any room in your home! That’s why I love them! I also love making pillows. For our home and for my clients. I also love to make pillows with cording around them. Cording adds such a nice custom touch to pillows. For years I made pillows with cording, (click here to see that tutorial), but I always hand-sewed them closed (click here to see that tutorial). But, then I was stuck with that pillow cover on that pillow form. There was no easy way to change out the pillow cover. That’s where this tutorial comes in. Today, I’m going to share how to put in a zipper for pillow with cording! Now you can have that custom corded pillow with a zipper! Fabric of your choice for pillow and cording – amount needed depends on the size of pillow. I’ve created a detailed video tutorial to show you how to put in a zipper for pillow with cording. I’ve also written out the steps below the video for you to follow along. NOTE: It might be helpful to watch these video tutorials first if you’re not familiar with making pillows and cording. Cut out the front and back pieces of fabric for your pillow. Both pieces are cut the same size. I like to cut my fabric pieces the same size as my pillow form. For instance, if I’m making an 18″x18″ pillow, I would cut the fabric at 18″x18″. This makes for a pillow cover that’s not loose and baggy on the pillow form. Sew cording around all 4 sides of the front piece of fabric. Serge all 4 sides of the the front and back pieces of fabric. This will help to keep the fabric from fraying. Lay the front piece of fabric that you’ve just sewn the cording around face side up. Lay the back piece of fabric face side down on top of the front piece of fabric. Mark 2″ from each end of the bottom edge. Sew from end of fabric to the 2″ mark on each end of the bottom edges, using a 1/2″ seam allowance. Sewing the front and back sides together. Use a zipper foot, and a medium stitch length. Lay the zipper face side down on the cording. With the teeth of the zipper along the cording. Sew the zipper into place. Being sure to sew close to the zipper. The zipper needs to be partway open, and the zipper pull needs to be up. Pin the other side of the zipper to the back side of the pillow fabric, and then sew into place. To make the placket, pin the back side of the fabric next to the cording. On the wrong side, sew along the zipper. Making sure to take the pins out as you sew. To finish the pillow: With right sides together, pin the other 3 sides of the pillow. Sew 3 sides together where pinned, using a 1/2″ seam allowance. Yay! You’re done! That wasn’t so hard, was it? I hope you’ve enjoyed this how to this how to put in a zipper for pillow with cording tutorial! Pillow covers are one of the fastest ways to freshen up a room. I’m still practicing, but I love being able to whip one up with some new beautiful fabric. Thanks for the sewing tips. 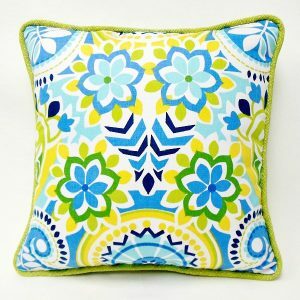 Love all your pillow tutorials, Jann! Pinned! Thanks Julie! I appreciate the kind words! Julie, I’ll check it out. Thanks! Excellent Jan and now I know where to come when I need sewing advice. Pinning for reference. Thank you my cushions are almost ready for their zips ! Another great video ! Thanks Gavin! Good luck with your project! Zippers are so difficult for me but your step by step instructions make me want to try this. Thanks. Thanks Patti! You can do it! Jan the pillow looks so much more polished with that cording on top! And I always had trouble with zippers but your tutorial is so easy to follow!